I recently had some American and English visitors on a tour of the village. I found it interesting to hear their thoughts on the area and I always get as much from their perspectives and questions as I ever give. In the same way the perspective of others from years back can be very illustrative and informative about our country or our locality. I have used the travels of Arthur Young before to illustrate what life was like in Faithlegg and Cheekpoint in the late 18th C. But today we have a German visitor, JG Kohl, who traveled from Waterford to New Ross on a paddle steamer whilst touring Ireland in the autumn of 1842. 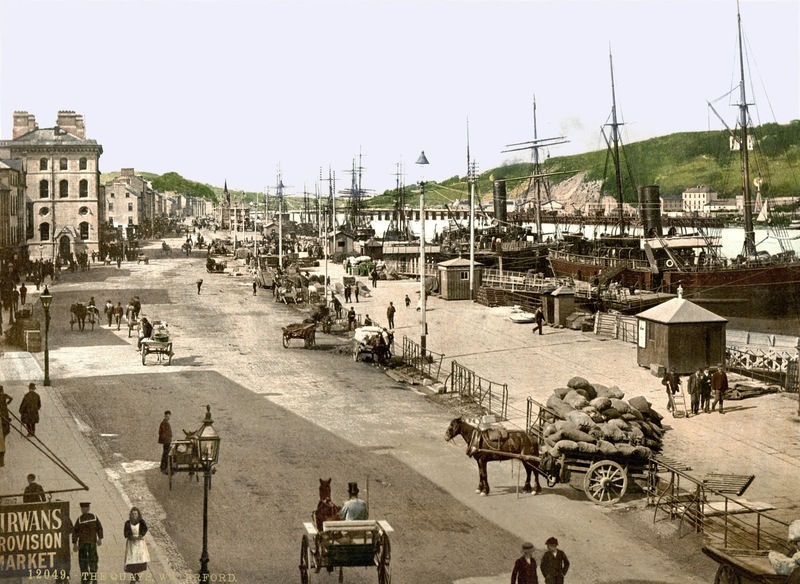 Waterford possesses two prominent features which are of the greatest advantage to its trade: first, one of the most wonderful quays in the world; and, secondly, one of the finest harbours in Ireland. The quay is a mile long, and so broad and convenient withal, that it must be invaluable to merchants and mariners. It is skirted by a row of elegant houses; and the scenery on the opposite side of the river, which is here a mile and a half wide, is extremely picturesque. …when I came to the river, it was exactly low water. Several vessels were lying on their sides in the mud, as if stranded. Above the beautiful bridge, the Suir seemed almost entirely drained, and the banks were slimy and muddy. But as the tide rolled in, the sand-banks were covered, the ships righted themselves and danced upon the waves, the artery of the river was filled, and the landscape again reflected in its restored mirror. The sun mounted high in the heavens, and our steamboat, The Repealer, rushed forth through the waves. What is there to be found in Ireland that has not some connexion with repeal? 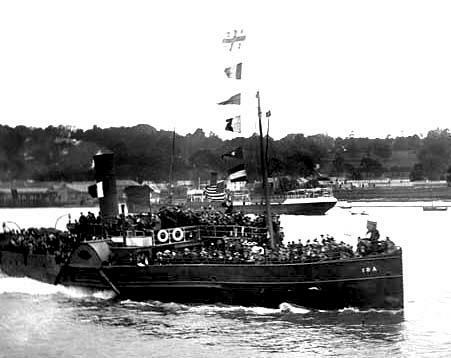 I was informed that the repealers go almost exclusively by this boat, and hence it was also called the People's Steamer. On the flag which waved from the quarter-deck were the words, ‘Hurrah for the Repeal of the Union!’ O'Connell can now, at his meetings, truly boast that the repeal cause is progressing with the rapidity of steam. In this corner of the earth, indeed, steam does not go very far—only to the town of New Ross, fifteen miles distant, whither we were bound. Nor does it afford any exclusive advantage to the repealers, as the anti-repealers also employ steam in their cause. Another steamboat, bound to the same place, splashed alongside of us, in opposition to ours. In England one never gets rid of this opposition: it follows him every where. 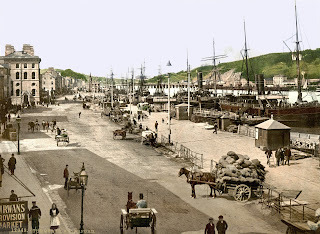 Had I not been in Scotland, and sailed down the Firth" of Clyde, I would pronounce this trip on the arms of Waterford Harbour to be the finest in the United Kingdom. Or, were there not much that is beautiful out of the United Kingdom, I could also say that it is the most delightful journey I ever made in my life. But it is sufficient to affirm that the landscape on the shores of these waters is as picturesque, pleasing, and diversified in its kind as any other in the world. The waters flow through the deep and convenient bays somewhat more quickly than through a lake; and as its entrance from the sea is concealed from the spectator by a very sudden turn, he actually believes he is on an inland-lake, and is astonished at the large ships which ascend it, seeking harbours hidden far in the heart of the land. At times the shore is a hill, sloping down to the water, which, like almost every river-bank in the United Kingdom, is studded with charming seats and pleasure-grounds; at others, it juts out in steep, rocky, and wooded headlands, which the Repealer almost grazes as she speeds past. At no great distance below United Kingdom are seen, in the background of a bay, the immense ruins of the far-famed Abbey of Dunbrody, one of the most celebrated and beautiful ruins of Ireland, which are here held in about the same estimation as the ruins of Melrose are in Scotland. Alas! they are now, like the times of their grandeur, in the far distance; and the Repealer has too much to do with the opposition steamer, which is walking close upon her heels, and forces her to keep her straightforward way, to turn from her course, and give the traveller a look at the ruined abbey. In truth, it afforded us no little amusement to see our rival, as she was about to turn into the mouth of the Barrow, run aground on a sand-bank, where, as our captain drily observed, she must stick till the tide would rise somewhat higher, and float her off. As for the Repealer, being obliged to be at New Ross by a certain time, she soon left Dunbrody far behind, and splashed away with the flowing tide up the Barrow. The British Islands must reap important benefits from the double alternating currents, one landwards, the other seawards, of the navigable rivers. In no other country do the waters of the sea flow so far inland, bearing ships into the very heart of the country. On the deck of an Irish steamer there is seldom a want of entertainment. On the quarter-deck the company is twice as talkative as on that of an English steamer; and the forecastle resounds even with music and singing. To the music, which, of course, was that of the bagpipes, we had dancing. Since Paddy, as I have before remarked, generally uses only an old door, or a couple of boards laid close together, for a dancing-floor, he naturally finds it impossible to leave unoccupied the beautiful space which, on the deck of a steamer, remains vacant, between butter-firkins, flour-bags, egg-boxes, hen-coops, baskets of turkeys, tied-up cows, and a confused heap of grunting pigs. He therefore lays aside his stick, and throws his cares and his sorrows to the winds, with much greater ease than can be done by the rich man of five thousand a year who is looking at him; with good-humour in his face, he seizes a struggling maiden, and, in a merry and lively jig, or Scottish reel, he shakes his rags as if they were the bell-tipped lappets of a fool's dress. The splashing paddles of the steamer beat the time for him, and the lovely banks of the Barrow give to this spectacle a decoration which the ballet-dancers on the boards of Covent-garden or Drury-lane cannot boast of. The evening was wondrously calm, and even the fishes, though still poorer than Paddy, jumped in the water for joy. I planted myself beside the captain, on the high platform in the centre of the vessel, and, while I observed the grave and serious rich on the quarter-deck, and the merry poor in the forecastle, I could not refrain from praising the justice of God, who, while he makes man poor, at the same time renders him more capable of taking delight in the most trifling things. The beautiful seats of the Powers, the Asmonds, and other families which lay along the banks, are all so charming that one would like to take a sketch of each separately. Near Castle Ennis, in a broad beautiful meadow, stands the largest, most lordly, and picturesque oak I ever saw. One looks on these mansions with increased interest, if, as I had, he has an Irish priest as confessant at his side, who, from being intrusted with the private affairs of the families that reside in them, can give him a sketch of the history of each. While I listened to my priestly confessant, I was somewhat amazed at the extra-ordinary things which happen in the usual every-day life of these families. In one of these mansions there yet dwells an old lady, the widow of one of the most distinguished of those rebels who were beheaded by the English during the last rebellion in Ireland. As we passed a rock, our cannon were fired, in memory of a sailor, who, some months previously, had fallen overboard at this spot, and was drowned. The reports were re-echoed from the rock, and the manes of the dead were no doubt highly gratified by the honour thus conferred upon them. We anchored at New Ross, and as this place is the extreme end of the Barrow navigation, and the brightest gem in the entire landscape-gallery of the neighbourhood, it would no doubt have well repaid us to pass this delightful evening here. It is at once apparent that New Ross is an old town, since it does not present that picturesque grouping which is peculiar to new regular towns: at the same time it is also a fallen place, for it is said once to have possessed a great part of the trade which Waterford has now entirely drawn to itself. It no longer dispatches a single ship to sea, and merely sends agricultural produce to Waterford, to be from thence exported. Beyond New Ross the waters, which had hitherto been broad and deep, seem entirely to lose themselves in a thicket of woods and rocks. In this thicket there are said to be most beautiful scenery, splendid landscapes, and waterfalls. Yet it was not granted me to explore these beauties any further. As I found my travelling companion disposed to avail himself of the beautiful moonlight night to continue his journey, at eleven o'clock we troubled an Irish horse and a little jaunting-car to take us over to Wexford, about twenty miles distant. Johann Georg Kohl (1808-1878) was a German scholar, cartographer and geographer, who visited Ireland in 1842. 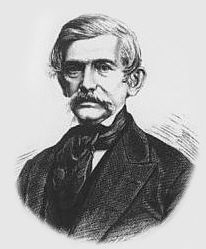 His intention was to see it "without any object in view other than to become acquainted with the country, and to see everything that was interesting and remarkable in it" He was a native of Bremen, and he studied and traveled widely and was noted for his unbiased perspective. As such his views on Waterford and the harbour should be seen and judged in this light. A man after my own heart, you might say! 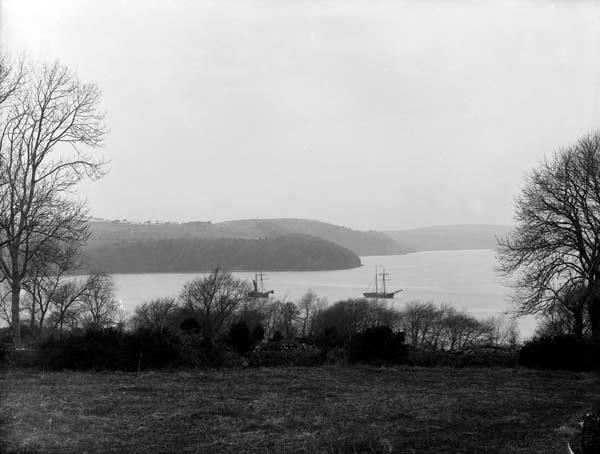 I'm only speculating that the Repealer was a paddle steamer, but most ships involved in the Waterford New Ross or Waterford Duncannon ferry trade were to my knowledge. 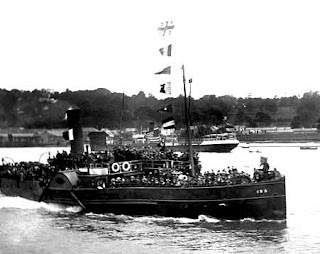 I had not heard of the Repealer before but an online thread suggests she was brought in as a rival to challenge the Waterford New Ross Steam navigation company but only lasted some months. Thanks to Frank Murphy for his kind assistance. Very interesting Andrew what a lovely turn of phrase has the author. Well found and presented.